Woke up this morning to the one things I wasn’t quite ready for… snow on the hood of my car, and on the grass, and on the roof of the house. Just a a light dusting, but boy! So not what I was ready for at all! Last week was beautiful and, for the most part, warm. This week is still beautiful, but not so warm now. Dots and his ladies enjoying their morning breakfast ‘treat’ of scratch grains and wild bird seed. Every morning, I’ve been I’ve been giving the birds a scoopful of scratch grains and wild bird seed (the kind with the black sunflower seeds mixed in with other stuff) to start their day. They’ve come to expect it, so yesterday, when I was gone and Dad filled in or me, he let them out of the coop as usual, only to have them make several attempts to go back inside the coop and follow him into the barn. Because I forgot to tell him about their morning treat. Oops. Poor babies. Poor Dad! He couldn’t figure out why they were bugging him! The only time I don’t give them any is if we have table scraps to pass out, because I figure they don’t need both. They’re all ready pretty spoiled for barnyard birds. At least, that’s what I’m told constantly. That I spoil them too much. But you want to know what? I’m not the only one. A couple of days ago, Dad took the last of the winter squash out of his garden and opened up the gate so the chickens could forage off the last of the ones he wasn’t taking, not to mention all the leaves, bugs and what-have-you that got left in there. See? Looks like fun, huh? Almost makes up for the coder weather, right? Being able to scratch around in the ‘forbidden zone’? As I type this, it’s flurrying again. I’m glad we have chickens who are supposed to be winter-hardy birds, because it looks like winter is going is going to rear its head before autumn is half over. I’m thinking about bringing the birds warm oatmeal for their morning treat tomorrow, and hoping DH finishes the wind-break he’s putting up around the run soon. Other than that, I think the chickens and I are ready for winter. I have metal waters, and plan to keep one in the house overnight to swap out if the water freezes, I’ve checked the coop and barn for drafts and we have the wind break in the works. I think I ought to take my camera out and see how the chickens are liking the snow flurries. None of them have seen it before, as they’re all only six months old. Why yes, I am being watched. Our chickens love the cooler weather, but we have it a bit more gradually usually. One item we invested in a year or two ago was a heated base to sit the metal water dispenser on. It only comes on when it gets down to 32-35°, but we leave it plugged in so we don’t have to monitor it too much. We found it didn’t seem to make much of a difference on the electric bill either, so now we just have to reclean the coop and install it again. The cleaning happens frequently, especially during the winter as they tend to hide out inside on especially cold days. Where do you live and how cold does it get in the winter? Curious because my husband wants to use heat lamps for the days/nights when it’s in the negatives. We live in Idaho where it is currently doing good to get into the cold drizzly 60s with lows in the 40s and 50s this week. In November we have seen negatives for lows with teens for highs, though this isn’t real usual. Our heat lamps are used when it gets into the single digits and negatives at night and during the day, but otherwise we don’t use them unless we have babies. The base under the water is used to keep the water from freezing. We sit it on the base and only take it off to refill. Otherwise when we get to teens, single digits and negatives, it freezes and then we have to thaw it out each morning and check it several times during the day. The chickens love to go into the coop and drink the unfrozen water that is slightly warm on really cold days. We have found it to be much nicer as our hens love to venture outside even when it is in the single digits for at least a few hours in the middle of the day. Otherwise they get rowdy inside although we will have an enclosed run for them to use this winter so we will see how it goes. 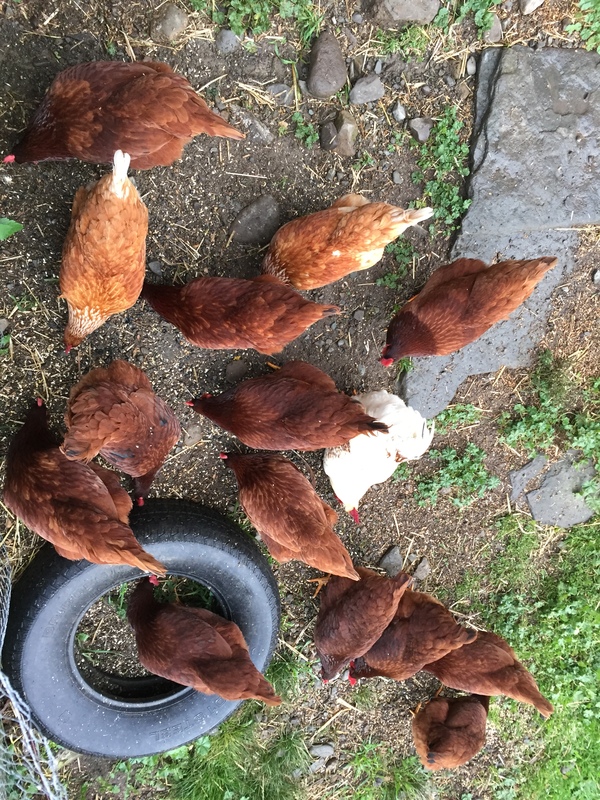 We have seen negatives for highs and lows (-10°F last year for low and -3° for high) for as long as a month and even though they have a nice coop, it gets “old” with 13-17 chickens all together. They don’t lay as many eggs during the winter but they remain healthy with an hour or two in the sunshine–cold as it is. I’m in Michigan’s Upper Peninsula, so we get cold and tons of snow (luckily haven’t seen any yet this year though). Last winter we had temps in the -10, -15 range during the day on some days. I kept a red heat lamp on in my coop 24/7, and they seemed to do well. I didn’t notice a drop in egg production, but my hens were new so my first eggs were late October last year. I also found a heated “dog water bowl” – I put a rubber liner in it so i could clean it easier, (the rubber bowl pops right out for cleaning, and it won’t melt, which was my concern – I don’t think the water bowl heats up that much though) – the water bowl heats up if temps get below freezing, so I had non-frozen water all winter for them – I would just refresh it twice a day since the chickens are messy.. My chickens didn’t like coming out in the snow at all, so they ended up staying in the coop all day even when we had the door all the way open. We installed a small chicken door for them, so that was open in case they wanted to go out. I’ve heard you don’t need a heat light for them, but I just couldn’t stand not giving them one with how cold we get. i’ve heard red is better, it keeps them from picking on each other as much. Another thing – if you have larger combs on anyone, you’ll want to swoop in with some vaseline to coat their combs, to prevent frostbite. I will have lots of vaseline duty this winter with my boys. My hens don’t really have big combs. I am not sure if Dots would be considered big or not, but I was prepared to vaseline him anyway. They’re doing REALLY well and mostly very happy little birds, and Little Dude and I enjoy their antics. Over the weekend, I was in the coop at a different time of day (I do their cleaning/feeding later on Sundays because of church) and found out that one of my girls roars like a dragon if she’s trying to lay an egg and has unwanted company. No other way to describe the sound. She growled and roared at me the entire time. I would never have guessed which hen it was, either, because outside the laying box, Riley is a little sweetheart.